The Albuquerque International Balloon Fiesta is a yearly festival of hot air balloons that takes place in Albuquerque the first full week in October. The balloon fiesta is a nine day event, and has around 750 balloons. The event is the largest hot air balloon festival in the world. The balloon fiesta began in 1972 as the highlight of a 50th birthday celebration for 770 KOB Radio. 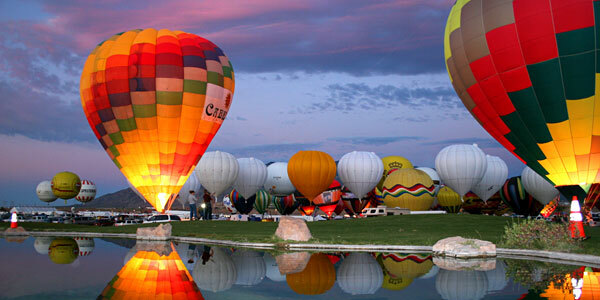 The next year Albuquerque hosted the first World Hot-Air Balloon Championships in February and the Fiesta became an international event. The Balloon Fiesta grew each year for decades, and today is the largest balloon convention in the world. For everything you ever needed to know about the Fiesta, please click the link below.